Worried, You Are? What Force Will Guide the States Through The Hexagonal? Steve Fenn relives the last USMNT series with Ewok-sized nuggets for you to digest. Is Jürgen Klinsmann the George Lucas of soccer? Like Lucas’ reimagining of special effects and science fiction storytelling in the late 70s, early 2000s Klinsi broke down the German system until he had something that made much more sense and produced a fantastic product. Both men have a checkered coaching (directing) history when they don’t have a very strong support staff. Jogi Löw gets much of the credit for Klinsmann’s semifinal run at the 2006 World cup, just as Lawrence Kasdan, Irvin Kershner, and Richard Marquand are commonly credited for refining Lucas’s vision for the original Star Wars trilogy. Lending credence to these theories, Klinsmann’s stints helming Bayern Munich and the US Mens National Team have been marked by bouts of tactical naiveté, over-ambitious rhetoric, and, at inopportune times, embarrassing results. Likewise, Star Wars prequel bashing is so prevalent that any attempt to further or indugle in it would be banal. The throughline, though, is the prevailing notion that these men moved onto later projects without the support staff that had molded their ideas into practical applications. At least, that’s the playful spin of the common narrative I heard and somewhat bought into between the 2-1 nailbiter in Antigua and the 3-1 smackdown of Guatemala that capped the semifinal round of US world cup qualifying campaign. Based on the vitriol hurled at Klinsmann, you’d think he’d encased Jozy Altidore in carbonite and forced Landon Donovan to dance for him in a metal bikini. The truth is complex, and our expecations for qualifying may have been unrealistic. To try to cut through the rhetoric, to the Opta Chalkboards for insights we go–include your normal disclaimers on “data can be made to explain anything”– from all 6 semifinal World Cup Qualifiers. If any of the language of this article or the Chalkboards themselves are unfamiliar, check out this page of Opta definitions. The hope by the faithful was for a slaughter when Antigua & Barbuda visited Raymond James Stadium. Instead, fans got drenched with a clear but uninspiring win. Looking back on the match through the Opta lens, one tale could be the old US nemesis–just ask Jozy Altidore–of “finishing” as the main culprit for the lackluster scoreline. 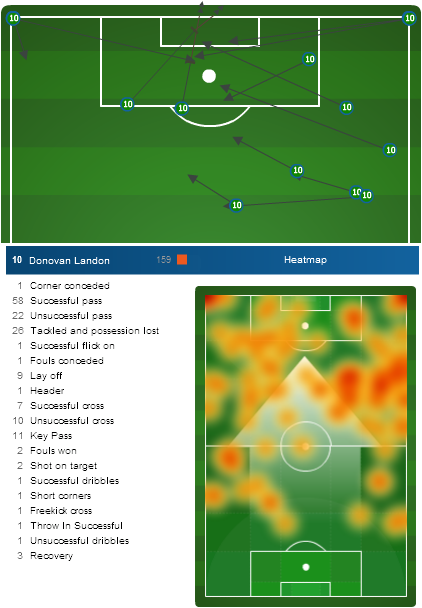 Here are all of Landon Donovan’s passes in the match that led directly to a shot (aka key passes). Do you miss Landon? That’s 11 chances created by one player. The rest of the team created 8, and there were 8 other shots that were unassisted (including all 3 goals). Taking the 44th minute PK out of any analysis of US finishing, the States took 26 other shots, 11 of them on target, but only 2 of which scored. The problem here was finishing, which we see a few times from the US qualifying campaign. Also, keep in mind that the vast majority of the A&B squad (15 out of 20 on their most recent roster) play together professionally for Antigua Barricuda FC in the US 2nd tier, USL Pro. Very few national teams know each other that well, and it makes sense that A&B played more cohesively and with better results than expected early in qualifying. 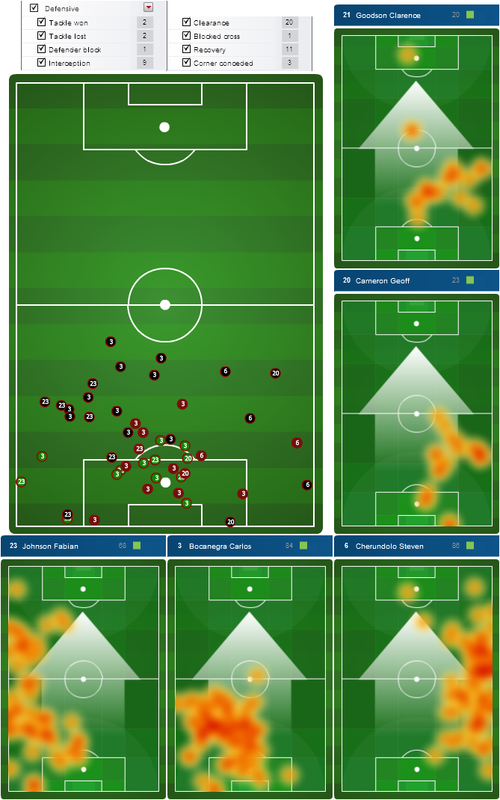 In all of the other matches, US defenders made defensive plays further up the pitch, and their heat maps rarely showed them setting foot in their own penalty area. This was the match where Klinsmann’s precious high defensive line tactic simply didn’t happen. No wonder this was the only match where US’ shot locations were no better than those of their opponent. No real standout performances and a pretty much even goal expectation off of shots created led to an uninspiring tie. Had enough negativity? Well the loss in Kingston has that eluvise fuzzy-and-warm lining. To illustrate why, take a look at Jamaica’s shots and the passes that created them. Those shot outcomes are too accurate for CONCACAF. Not even Europe’s elite are that precise. Jamaica never took a shot closer than 30 yards from goal, and scored on two direct free kicks, an event so fluky that it only happened once over the entire 2011-2012 EPL season. Going forward, if the US limits opponents to a shot chart like that, it will be overwhelming likely that Tim Howard records a clean sheet. There were many beautiful aspects of this match, savor them. Every starter looked quite good, as long as you ignore their strike rate. It seemed appropriate to focus on the wingbacks in this match, since Steve Cherundolo was a primary reason–Dolo gone loco says this essay–the US was thoroughly in control for most of the game and Fabian Johnson was so offensive that they had to bleep him whenever he was on the screen. These two created 4 scoring chances (…counting the through ball from Johnson to Gómez that was incorrectly flagged offside in the 33rd minute). 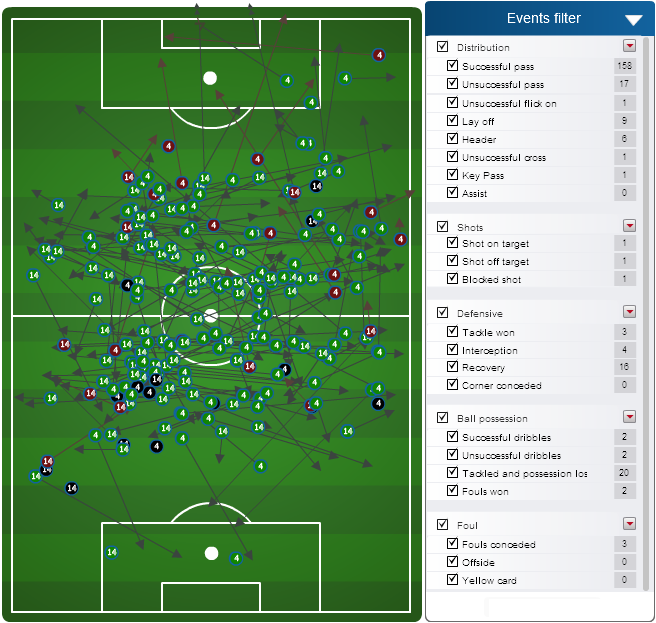 While consistently cycling the ball amongst attackers, they completed 118 passes, and only lost possession 29 times. Overall, the first half of US vs Jamaica in Columbus on 9-11 was the most beautiful display of attacking football witnessed in this iteration of the national team. 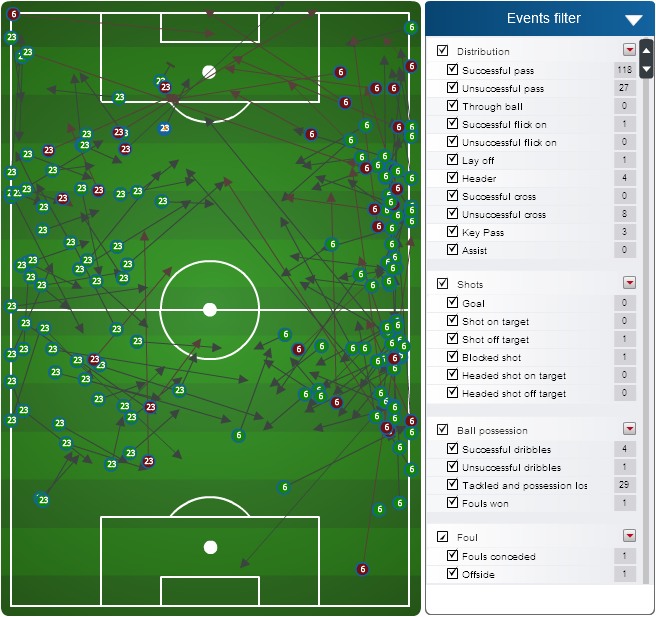 Before the break that night US outfield players completed 346 of 393 passes, leading to 13 shots. If the Chalkboard from that half were bichromatic and devoid of dots it would resemble the special effect for warp speed in Star Wars. It was exquisite to see in person, better than the first drive in experience of Princess Leia. Consider the statistics for the match in Sir Vivian Richards Cricket Stadium to be tainted. Well maybe that goal does say something, quick staccato passes with little dribbling and time in possession maybe should’ve been the way the US attacked the entire night? Like Jamaica’s visit to Ohio, this match was a rout. Comparing the passing charts of the two teams is almost comical, since Michael Bradley and Danny Williams had more successful passes than the entire Guatemalan side. Like brothers from another mother…. Bradley and Williams completed 158 passes, and only lost the ball 20 times! Guatemala completed 146 passes and lost possession 115 times. Generally, it’s dangerous to analyze raw passing stats, but in this case the overwhelming evidence is that the US ran circles around a reasonably dangerous CONCACAF opponent almost the entire match. Beyond the gut-punch in the 5th minute when the stuck up, scruffy, half-witted Pescadito, Carlos Ruiz, outran Bocanegra, rounded Howard and opened the scoring, Knights of Columbus! this was better than Jamaica at home. Washy semi-optimistic conjecture on some of the US’ problems is easy to type and to that the notion is that the players are still thinking too much on the pitch about Klinsmann’s rapid distribution system. Pour in a line-up that is never redundant (in the last 20 matches the US has had 20 different XIs) doesn’t help the transition. The less optimistic followup to that theory is pondering how much work and repetitions are necessary to be at a progress-past-the-Hexagonal level. Howard, Donovan, Dempsey, Bradley, Williams, Cherundolo, and Johnson seem a strong, dynamic core who are quite capable of driving the USMNT to Brazil, but fitting together with other interchanging parts and succeeding is another thing. 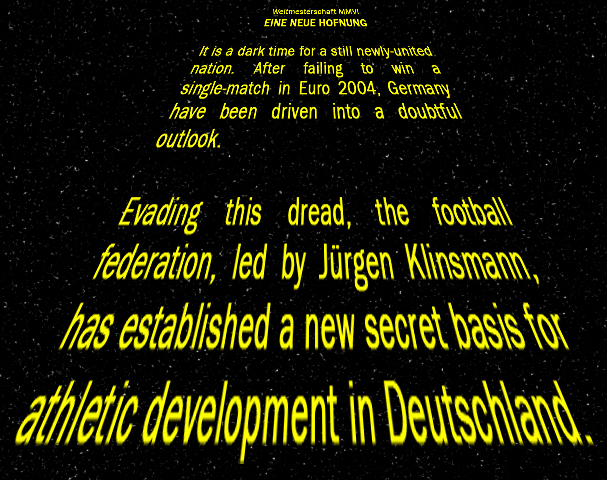 Is Klinsmann Yoda or the Vader? Great stuff Steve and thanks for the time and research investment. Does put a little perspective on the qualifying angst. Plus if nothing else quals gave us “Seventh Chances: The Eddie Johnson Story” a Lifetime original. Would be interesting to see the CMF/DMF passing comps game to game. 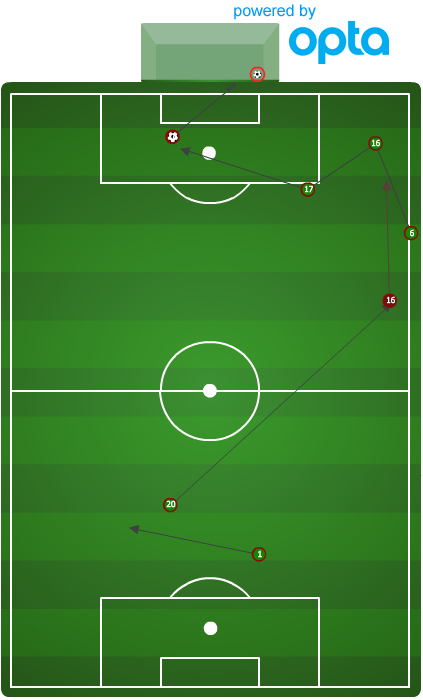 Gut instinct on watching says that Mikey/D Wills is a much more effective combo in those roles than with Edu/Jones or any of Klinsi’s other combos. Steve — great stuff. I tried desperately to edit in a Jabba the Hut reference but to me Blanco is Tummi Gummi. Anywho, liked the little vignettes of data, but I would say in regards to Guatemala, I thought the US played a solid match. They had to deal with a team that was rested and bringing quite a bit of pressure, so much that the Almeida subbed three people after half-time to keep up the pressure. Thought it was a pretty good effort from the States, even if they didn’t control the run of play for large stretches. Yeah, it could well be that the performance in Guate was better than the data suggests. I didn’t have it on my DVR while writing, so my memory of the flow of the match is a bit hazy. Now that I think about it, Cameron did have a couple really nice moments that only show as individual dots on the Chalkboard. The passing stats by MB90 and Danny Williams make me hopeful for the US moving forward. We have far too often had the partner/ other 2 mids in addition to MB90 either be too slow (Beckerman) or too wasteful (Clark,Edu). Williams seems to be a very good partner for MB90. I also feel very confident in the US ability to create chances when both Johnson and Dolo are the fullbacks. I do not feel confident when Klinsmann says that anyone can play left back and refuses to call in replacements when players pull out injured. I picture that conversation between Klinsmann and his assistants to be similar to what I hope took place when Lucas introduced Jar Jar Binks to his assistants. In terms of hairstyle, Klinsmann is clearly Luke Skywalker. When has JK’s refusal to call in replacements actually hurt the team? As for his left back comment, that was in reference to the first A& B game and it seems to me the US won that 3-1. Just my luck to put the typo in the place that’s hardest to fix. Dang it, should have read 2004. I’ll try to correct that myself, but it might take me a little while. Ha! Just busting your chops! Great read as usual. You guys definitely make my commute more bearable and I always learn something. Thank you. My bad — just fixed it. Editor error. I think for next year we’re going to see much of the same from the US. At home games that make those that love Opta such as myself drool and away games that want to make you tear your hair out. The thing is how to make the US win those games instead of tying or losing them, because flukey things (like Jamaica away) and CONCACAF go hand in hand. Anyone know where I can find the possession stats from round three of WQC in 08? I have been curious to compare the last cycle to this one. I know possession stats aren’t a great indicator but it seems like possession would be the first phase of the transition that JK promised. I know we had a couple of really strong posession games something I don’t seem to remember happening under Bradley. I searched the Internet for about an hour to no avail. Keep in mind, the US probably faced better opponents this year than they did in the same round in 2008. I think Guatemala has improved, 2012 Jamaica is better than 2008 Trinidad & Tobago, and 2012 A&B played as a team far better than 2008 Cuba.